Check electrical outlets for loose-fitting plugs that can cause shocks or start fires. Replace missing or broken wall plates, so the inner wiring components are not exposed. If you have young children, use safety covers on unused outlets. 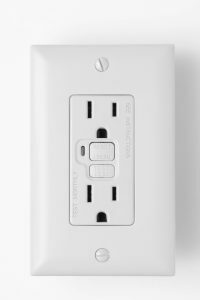 Consider installing tamper-resistant receptacles with a built-in shutter system that prevents hairpins and other small objects from being inserted into the outlet. Check the cords of the appliances in your home, as well as the plugs and connectors. Make sure they are not frayed, cracked or damaged, placed under rugs or carpets, resting on furniture, or in high traffic areas. Do not nail or staple cords to walls, floors, or any other objects. Extension cords should be used on a temporary basis only. They are not a permanent wiring solution. Have additional outlets installed where you need them. If you are using extension cords, make sure they have safety closures to protect young children from shocks or mouth burns. Check your electric panel to make sure the breakers and fuses are properly rated for the circuit they are protecting. Have a qualified electrician identify and label the correct size to be used if you are unsure. When replacing a fuse, use the same size. Check light bulbs and appliances to make sure the wattage matches fixture requirements. Do not replace bulbs with higher wattage than recommended. The bulb should be securely screwed in to prevent overheating. If an appliance repeatedly blows a fuse, trips a circuit breaker, or gives you an electrical shock, immediately unplug, repair, or replace it. Check for or install ground fault circuit interrupters (GFCIs). A GFCI is an inexpensive electrical device that shuts off power instantly if there is problem. GFCIs should be installed in all “wet” areas of the home, such as bathrooms, kitchens, and basements. GFCIs should be tested monthly to ensure they are working properly. The Consumer Product Safety Commission estimates GFCIs could prevent more than two-thirds of the roughly 300 electrocutions that happen each year in the home. Consider installing arc-fault circuit interrupters (AFCIs) on bedroom circuits, have smoke detectors in all bedrooms and in hallways within 15 feet of bedrooms, and at least one smoke detector on every level. Carbon monoxide detectors should also be within 15 feet of each bedroom. As always, check with your local electrical inspector if you have questions or concerns. Inspect all outdoor connections, appliances, and tools for frayed cords, broken plugs, and cracked or broken housings. Repair or replace damaged cords and appliances.